If you’re new to slide guitar playing, you’ll probably notice 3 basic obstacles. Below I’ll give you the 3 corresponding solutions, to help you get started with slide guitar playing. 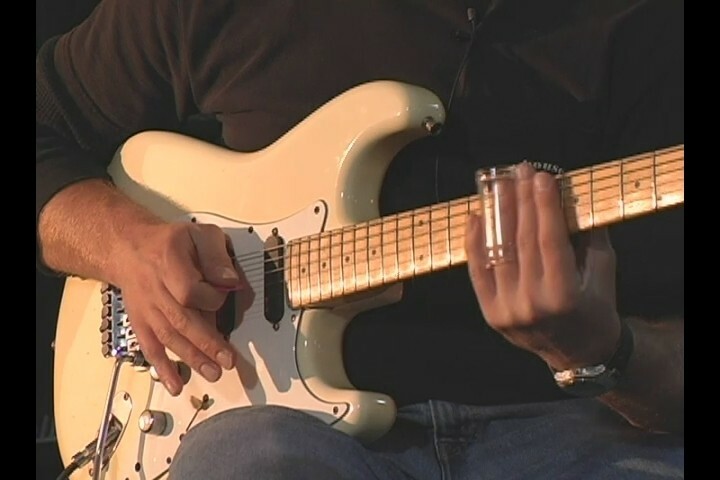 The key to slide guitar playing, and the main thing to distinguish it from normal playing, is that you should not apply the normal amount of pressure with the fretting hand. The slide should just touch the strings, lightly making contact, rather than pushing the string onto the fretboard as usual. The slide should never really make contact with the wood, but rather just “slide” along the string independently. Put the slide on your ring finger. When playing a note, both your index and middle fingers rest on the strings behind the ring finger. This way, your index and middle fingers “damp”/mute any unwanted noise of strings ringing out that may happen due to the light touch involved in slide playing (as covered in point 1). You shouldn’t place your finger in the middle of the desired fret as per usual, but rather above the metal bar at the “end” of that fret. ie. If you want to play a note on the 7th fret, the slide should be positioned above the metal bar between the 7th and 8th frets.